It's time for the New Product Launch! All the Stamps, Die-namics, and Stencils can be found HERE. Please remember to visit each of the MFT Designers' May New Product Launch posts on the MFT Blog and leave a comment by the end of the day on Thursday, May 4 for your chance to WIN one of two, $100 Gift Vouchers. Ready? Set. Comment! 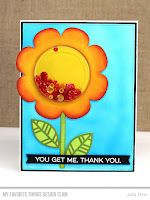 I have a couple of cards to share with you today featuring the new Shaker Flower Die-namics. I love having another die to use with the Circle Shaker Pouches. 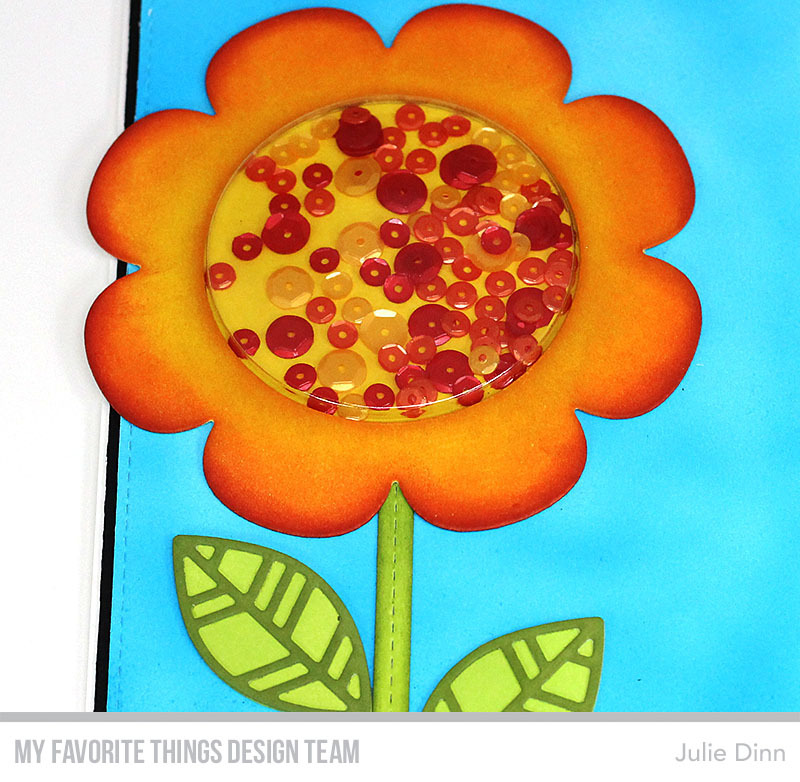 I die-cut the flower from Smooth White card stock and I sponged on a number of Distress Inks. I filled the shaker with some of my favourite Pretty Pink Posh Sequins. The sentiment is from the More Essential Sentiments stamp set. For my next card I used a number of Oxide Inks to colour the flower. Once again I filled the shaker with Pretty Pink Posh Sequins, and I paired it with a sentiment from More Essential Sentiments. Along the bottom of the card I used the Grassy Edges Die-namics to create a little grass. I love the cards. Waiting for my shaker elements to arrive. Love shakers, love the flowers, love these cute cards. Your shaker flowers are so cute. They can go for any occasion. Love the shakers and colors! Wow. Loving that vibrant orange against the blue background. These shaker cards are so fun. Wow! The flower shaker looks great in any color...love your bright colors. They really "pop!" These cards are as bright as a field of sunflowers on a sunny August day! So bright and cheerful, great job.! Love your bright and pretty shaker cards! So pretty! Love your skaker box ! Love the colors you chose on these beauties! This flower shaker die is on my wish list! Love these flowers as shakers, fun CAS! Love your flowers. The yellow one is my favorite. It gives you a happy feeling! Such sunny shaker cards! Brightens my day! I love the colours in this card. They are so vibrant. Thanks for the great inspiration. Wow! 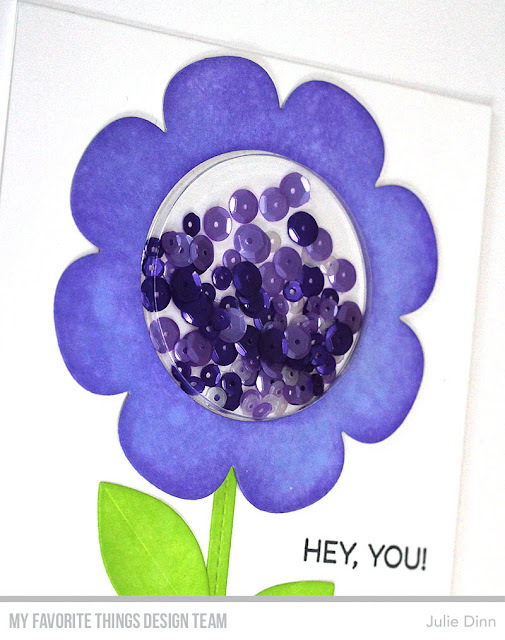 Beautiful flower shaped shaker cards!!! Love them!!! Love these easy to make shaker cards .Love the combo of blue and orange. Nice card. Love seeing different color takes. Thanks for all the inspiration this release! Great colorful shaker cards. Thanks for this inspiration! What cheery shaker cards! Love the colours you chose. Thanks for the inspiration! Love your colors! Those cards would for sure make the receiver smile. 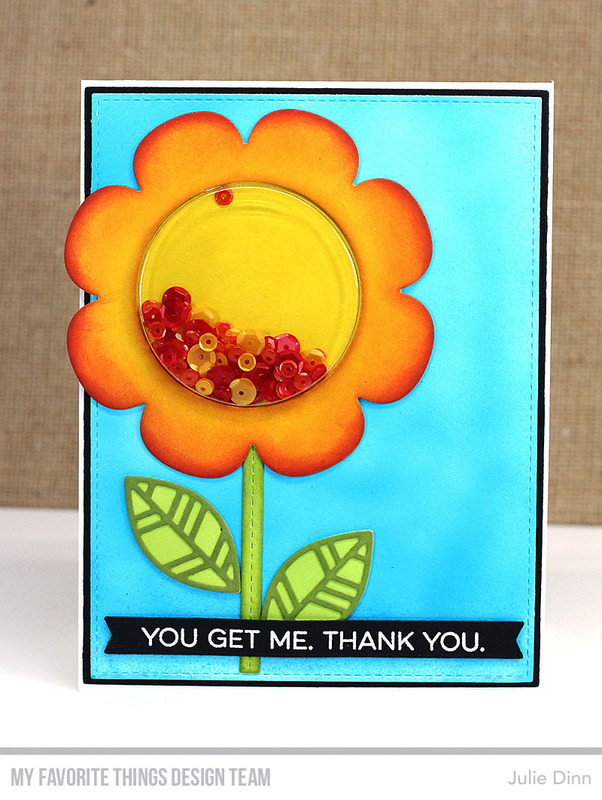 I'm totally in awe of the orage shaker flower card-it's gorgeously colored! Wonderful cards! I like both of them! I just love these shaker flowers!! Very cute shaker flowers--love the colors. Love these shakers!! Beautiful cards. Wow! Talk about bold and beautiful! Absolutely adore both the cards. Love these cards! This is such a wonderful die set; it is on my wish list. Super fun flowers! With the shakers too! On the MFT wish list! Adorable shaker cards with Amazing Bright colors!! Thank you for inspiration and sharing! I am excited to use this die set to make me some shaker flowers. I love the orange/yellow/blue combo. So bright and bold. The purple is also wonderful with the green. So many options to use this die set. Thank you so much for this inspriation! So pretty and very inspiring! beautiful set of shaker cards!! Wow, love the bold colors of your first shaker card. Beautiful set of shaker cards. Love that fun shaker flower! Great colors! Great cards. Just love this set. Love the bright colors on your shaker cards, so pretty! ! Adorable cards!! This new flower shaker die set is awesome. These shaker flowers are so bright and cheerful!! 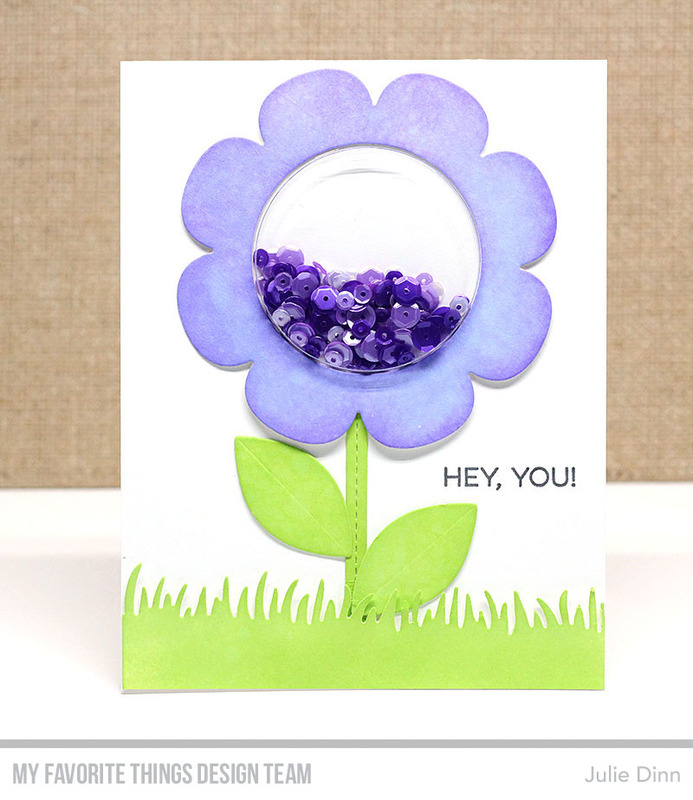 Love your flower shaker cards. This die set is next on my list. I will be using yours for inspiration. Love them both! I love both versions of your shaker cards. Terrific color combos. 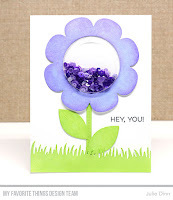 Great Shaker cards with this flower die. Cute shaker cards my favorite is the purple one. Beautiful cards, loving the new MFT products!